Well, it didn’t send me running for the kitchen. But I did enjoy this read. See, my mom had an aneurysm when my brother was born. She’s okay. And then my Oma had one. I remember that one. We spent a lot of time in the hospital. Lots of rehab. Lots of bouncing back. Aneurysms run in my family, and I’ve always had fear, respect, and interest when it comes to them. That’s why I picked this book up. It opens with Jessica’s aneurysm, which happened while she was running at a hotel gym. 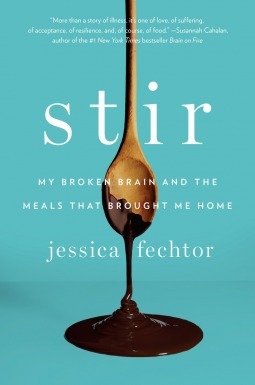 The story then follows her struggles and healing process, which cooking and food plays a major key in. There are even recipes sprinkled throughout the book. There’s something about reading books that feature real people that make me understand the “main character”. Maybe that’s because they’re real. But I got Jessica—I understood the pain and healing that she was going through. In a way, it gave me an inside look at what my mom and Oma went through. It was a slow read for me, and I found many parts to be dragging. Can I really fault the story for that, though? Isn’t that the point of an emotional and physical healing process? I shouldn’t, but it did make me take a long time to read the story. Overall, it was an enjoyable read, but I probably won’t be shouting about it from the rooftops. If you’re into inspirational healing journeys, this might be for you. I rated it a 3.5/5. I received a free copy of Stir from NetGalley in exchange for an honest review.